Quite a spectacular design. They are the easiest to print and I have produced many successful prints in the last few weeks. I am in the process (at the moment) of a 15 piece production run, all unique shell/body/color combinations. 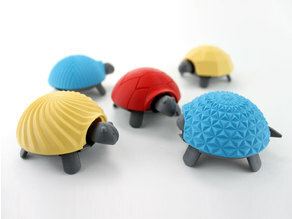 (Kindergarten Graduation Gifts and Lesson Plan, Create Your Own Turtle (My wife is a teacher)) If you have the skills and your printer is calibrated well you will have absolutely no trouble printing all the parts at 100 percent.No support, no brim just the model. I print the body in PLA at 20% and the shell in TPE/TPU at 5%. The body and shell both run at 50mm/s sliced in Repetier using the built in CURA slicer. I been printing for about 7 months (11/17) I've printed 100s of models and these are one of my favorites. I have had 0 (ZERO) failed prints when printing this model. The only post print processing is the excess plastic from where the head/neck/tail touched the bed (1st layer excess), just run a flat blade along the neck shaving off the excess plastic from both sides. The head/neck/tail will slide nice and smooth (If your rig is dialed in) . In my opinion, if you are forced to print the scaled down versions or you are experiencing unsuccessful prints, it may be a clear indicator that your printer is not calibrated, your having extrusion issues, nozzle issues or parameter issues. Final note, they are a hit with everywhere.The designer is quite skilled, I would like to one day to at least match the talent. Thank you. 3 different printers all printed successfully.